Smoke rises after an Israeli missile strike in Beit Lahia, northern Gaza Strip. HAMAS MILITANTS IN Gaza have fired dozens of rockets at Israel, which responded with multiple air strikes in a new escalation which threatened to spiral into another a major confrontation. It was the worst escalation in and around Gaza since November 2012, with tensions threatening to drag the region into a fresh confrontation as Israel sought to contain five days of violent clashes in Arab localities following the grisly murder of a Palestinian teenager by Jewish extremists. The Jerusalem Post reports that the militant has called up 1,500 reservists in what appears to be preparation for a new offensive. The barrage of rocket fire was confirmed by the Israeli military which said more than 40 rockets had been fired at the south within a short period. There were no immediate reports of casualties. “A barrage of over 40 rockets was launched from the Gaza Strip in the past hour. Seven rockets were intercepted over the city of Ashdod and five rockets were intercepted over Netivot,” an army statement said, indicating that 30 rockets had hit inside Israel. Sirens were heard in 10 locations, including in Beit Shemesh some 80 kilometres (50 miles) from the Gaza Strip, a military statement said. Around 16 struck the area around the southern city of Beersheva, 40 kilometres from Gaza. Beersheva is home to 200,000 people. The rocket fire was claimed by the Ezzedine al-Qassam Brigades, armed wing of the Islamist Hamas movement which has its stronghold in Gaza. “Al-Qassam fired dozens of rockets on Netivot and Ashkelon, Ashdod and Ofakim in response to the Zionist aggression,” a statement said. “Qassam rockets are a natural reaction to the Israeli crimes against our people,” said Hamas spokesman Sami Abu Zuhri in a statement. 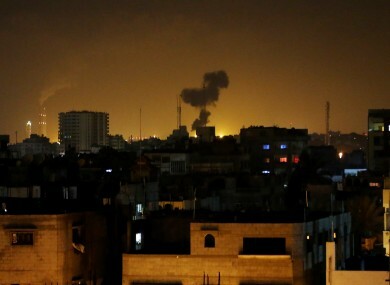 Shortly afterwards, Israeli warplanes hit more than 30 targets near the southern city of Rafah in an area close to the Israeli border which is riddled with tunnels, Palestinian witnesses and security sources told AFP. Israel’s Channel 1 television said the attacks came after the security cabinet gave the military a green light to “toughen the response to Hamas”. The channel also showed footage of dozens of tanks massing near the border with Gaza, preparing for a possible offensive against the enclave. “With this barrage of rockets, Hamas has crossed the red line, and unfortunately it will pay for it,” senior officials told the private Channel 10 television. The rocket fire came several hours after Israel staged around 16 air strikes on targets across Gaza, following a night in which warplanes attacked 14 targets, killing at least three militants, one from Hamas and two from the Popular Resistance Committees (PRC). “The Zionist enemy has opened the gates of hell on itself,” the PRC said. Another five Hamas militants died and one was critically injured when a tunnel collapsed near Rafah, with the armed wing blaming it on an Israeli air strike. But the Israeli army denied hitting the area, with a spokesman describing it as a work accident by militants mishandling explosives. The latest flare-up came a day after Israel arrested six Jewish extremists in connection with the killing of a Palestinian teenager, who was kidnapped and burnt to death in a suspected revenge crime after last month’s abduction and murder of three Israeli youths in the West Bank. During the investigation, three of the suspects admitted to the murder in which the victim was burned alive, an official close to the investigation told AFP. The July 2 killing sparked five days of violent clashes in annexed east Jerusalem and in Arab towns across Israel, with police arresting hundreds of people. “Three out of six suspects in custody have confessed to the murder and burning of Mohammed Abu Khder, and performed a re-enactment of the crime,” the source said, speaking on condition of anonymity. The killing has caused shock, outrage, and no small measure of shame in Israel. “To take a young boy, to kill him, to burn him — what for?” asked outgoing President Shimon Peres. On Monday, both Peres and Prime Minister Benjamin Netanyahu called the teenager’s father to convey their condolences and express outrage over the murder. “I am ashamed on behalf of my nation and grieve with you,” Peres said, while Netanyahu condemned the murder as “abhorrent”. Overnight, the angry protests which have gripped east Jerusalem and Arab Israeli towns continued to spread, with police arresting 110 people. Much of the violence began in the Triangle, a concentration of Arab towns and villages close to the border with the northern West Bank, but has since spread to the Galilee region as well as to the southern Negev desert. Email “Hamas rocket barrages hit Israel as region teeters on brink of new conflict”. Feedback on “Hamas rocket barrages hit Israel as region teeters on brink of new conflict”.